If you work with feet or are just curious in general, the Harris Ink Mat is a fantastic tool to see how weight is transferred to the foot. For this reason Structural Reflexologists® use the Harris Ink Mat to reveal areas of stress on the foot while the person walks onto the mat. 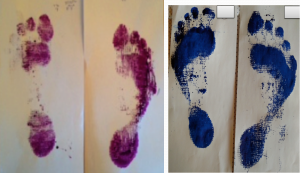 The action of movement gives the practitioner additional information about foot mechanics revealed by the ink print. After an assessment is made manual methods are used to release muscle and ligament strain in the foot and lower leg to create stronger, more vital, and functional feet. 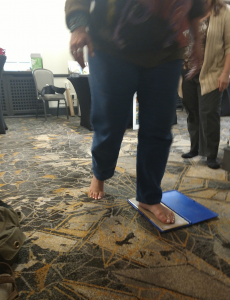 Walking on an ink press is a good way to understand how feet transfer the weight of the body. As mentioned in my previous blog: The Zen of Taking One Step there is an intuitive method of how the foot distributes weight as we walk and the success of this movement depends on the efficiency and healthy economics of muscles that move the feet. You may be familiar with popular kiosks in department stores where one can stand on a sensor to show pressure sites on the feet. The kiosk image makes an assessment based on stress while standing which is usually followed up with a sales pitch to promote inserts to lift and prop. However fun, this kiosk is limited in that it does not reveal how weight is distributed while walking which provides vital information in how foot muscles manage a balanced foundation for the body. While props may change the sensor reading, props also change the coordination of muscles that move the foot and often interfere with the appropriate course of foot movement. One of the greatest aspects of the foot is its joint structure which is constantly adapting to support the load above. The use of props are sometimes necessary but their long term use will weaken the feet because they immobilize the foot’s ability to adapt and therefore the body fatigues with the burden of managing weight when the feet have lost this function. While your friend observes, place bare feet on the floor and gradually lean all of your weight onto one foot, find your balance, and then lift the other foot off the floor. Your partner will observe the foot making constant corrections and adaptations to keep the body steady. The more one struggles for balance the weaker the foot. Now try this exercise with both feet on the floor and stand still. Your partner will still be able to observe small adaptations even while standing on both feet. Adaptability is a necessary and organic part of foot physiology. Much like the base of a building-the structure of the foot is kinetic in order to make necessary adjustments for stability. While stress is normal to maintain posture, excessive stress may indicate a failure in the organization of the foot. Ink press images uncover clues where the foot is breaking down and why this upsets the foundation the body. Stressors that may contribute to inappropriate weight usually manifest from shoes that interfere with and minimize foot function and in turn confuse the muscles meant to move the feet. The Ink press images below are a clients left and right foot. Day 1 in pink exhibits weight distribution issues. The imprint shows the left foot is not fully making contact and weight is not following the normal parameters of contact pressure from the foot to the ground. 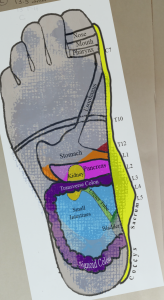 My assessment based on this print indicates an issue with the function of the transverse arch which provides a bridge for the distribution of weight to transition from the outer side of the foot to the toes. The misappropriated weight on this foot indeed revealed her complaint of chronic left foot, left knee and back pain. The image on the right in blue (DAY 2) shows the improvement of weight distribution after receiving a second Structural Reflexology® session the next day. After following up my client radiantly confessed her years of suffering from chronic leg cramps, foot and knee pain, as well as mental exhaustion had dissipated and she was elated to be experiencing renewed energy, enthusiasm, and joy. Ink press images are also a helpful tool for reflexologists who understand the feet as a microcosm (a mini-map) of the body because the print usually reveals where the body reacts to weight bearing. The image on the left is an imprint revealing weight carried by the left foot while walking on the Ink Press. The image on the right is the same foot with the reflex areas outlining the foot and where the body is impacted from how weight is distributed. This person had suffered a left foot injury several decades prior to this session. He was not exhibiting foot pain however was complaining of chronic low back pain. He was prompted by his wife to seek help with his foot deformity. After assessing this imprint I could clearly see how misalignment in the arch of his foot could add strain along his spine and possibly organ systems-and specifically, to his colon. When asked about his digestion, this client stated he was scheduled to have a part of his colon surgically removed in a few days. After this session, my client reported a significant decrease in back pain. Incidentally, foot measurements disclosed this client was wearing shoes that were one and half sizes too small. Using a Harris Ink Mat is helpful, but not necessary to assess for problems. Regardless, the advantage to incorporating this tool makes each session very personal. It’s another opportunity to educate clients about the local stress happening in their feet based on their print and how other areas in the body may be impacted.